On Saturday, January 29, the Hollywood Beautification Team will distribute 60 free bare root fruit trees from 9 a.m. to noon in the Vons parking lot at 4520 Sunset Blvd. Trees will be distributed on a first-come, first-served basis. Since its establishment in 1992, the Hollywood Beautification Team has worked to improve the quality of life in Los Angeles by teaching and empowering people to change their environments through community capacity building, physical improvements and job creation. What's your 2 cents on the city's budget? In just a few months, the City of LA's budget process for the 2011-12 Fiscal Year will officially begin when Mayor Villaraigosa releases his budget proposal to the City Council. Angelenos have the opportunity to make their voices heard by participating in the online Los Angeles Budget Survey. Visitors to the site can work with an interactive tool that allows them to review potential budget balancing measures and share their thoughts about the city's options. Responses will be collected and reviewed by the Mayor's Office. The Greater Echo Park Elysian Neighborhood Council (GEPENC) is supporting the Echo Park Recreation Center's new Zumba for Scholarships program. Zumba classes designed for beginners will be held Wednesday nights from 7:00 p.m. to 8:00 p.m. at the Echo Park Recreation Center gym (303 Patton Street). Each ten-week session costs $40. Thanks to the generous support of the Silver Lake Medical Center, 100% of the proceeds from Zumba for Scholarships will be donated to the Echo Park Recreation Center's athletic scholarships to give young people in Echo Park the opportunity to participate in organized sports. Email bacasigala@earthlink.net to sign up for the first session. In an unprecedented effort to identify and document places in Los Angeles of social, historical and cultural significance, the Office of Historic Resources is conducting SurveyLA. Survey results will shape community plans, facilitate environmental review processes, assist in disaster planning and tourism efforts, and provide educational opportunities. In this second year of field surveys and the project will be working with the community members in Echo Park, Elysian Valley, Silver Lake, and Westlake for assistance with identifying significant places in these neighborhoods. 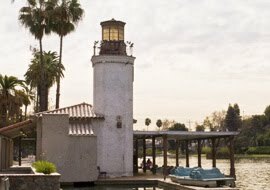 All are invited to share with Survey LA their unique knowledge about places in their neighborhood. To learn more about how to get involved, please join the City of Los Angeles's Office of Historic Resources for a SurveyLA Community Meeting on Thursday, February 17, 2011, from 7 p.m. to 9 p.m. The meeting will be held at Nuetra VDL House (2300 Silver Lake Boulevard). To RSVP or for more information, please contact Bryan Fahrbach with the Historic Resources Group at bryan@historicla.com or (626) 793-2400. This morning Councilmember Dennis Zine and I introduced a motion to offer a $75,000 reward for information leading to the arrest and conviction of the perpetrator who shot a LAUSD School Police Officer on Wednesday. In addition to the city's reward, other organizations have stepped up to offer monetary rewards so that there is now a total of $100,000 in financial incentives to help LAPD find the perpetrator. Yesterday, the LAPD released a composite sketch of the suspect (at right), who is described as a male Caucasian, in his mid-to-late 40s with long grayish hair pulled into a pony-tail, 5 feet 9 inches to 5 feet 10 inches tall, with a thin build. He was last seen wearing a dark colored jacket, possibly a bomber jacket or hooded sweatshirt, and denim jeans. If you have any information about the incident or the suspect, please call the Los Angeles Police Department at 1-877-LAPD-24-7. The CAL PAC Neighborhood Immigration Clinic (NIC) will hold immigration law clinics to connect members of the immigrant community with pro-bono immigration attorneys to assist people with individual cases as well as provide immigrant rights training for all attendees. Those interested in attending and receiving a consultation or volunteering should contact Jed Leano at (323) 843-4083 or jed@jedleano.com. In honor of the life and legacy of Martin Luther King Jr., I had the pleasure of spending Monday with community volunteers participating in L.A. Work's 20th annual MLK Jr. Day of Service. Hundreds of community members helped revitalize Rosemont Elementary School, working together to enhance unused areas of the school library, create a literacy garden, design a new game room, paint scenic murals, and assist teachers with their classroom needs. Dozens of other volunteer events were also set up across the city. In Glassell Park, the Los Feliz Charter School of the Arts organized more than 100 volunteers to help pick up trash and clean up the streets (see photo at left). 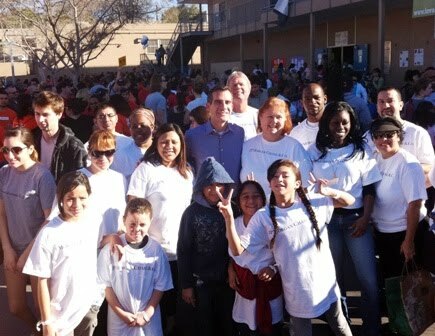 L.A. Works is a nonprofit, volunteer action center that creates and implements hands-on community service projects in the Los Angeles area throughout the year. During the past 20 years, its members have contributed more than 1 million volunteer hours to Los Angeles. Click here to find out how you can get involved in serving your community. The 2011 Greater Los Angeles Homeless Count is coming up -- can you give three hours of your time to help? Every two years the Los Angeles Homeless Services Authority (LAHSA) organizes volunteers to count homeless people in LA County. In 2009, thousands of Angelenos came together for the largest homeless count in the nation. That year, more than 50,000 homeless men, women and children were identified, providing data that is critical to addressing the complexities of homelessness and planning how to best invest public resources, raise public awareness, identify the needs of homeless people, and improve service delivery opportunities to prevent and eliminate homelessness in Southern California. Volunteers are teamed up, trained, and given all needed supplies. Volunteers are expected to devote approximately three hours of their time. I was honored to be a part of the Kingdom Day Parade in South Los Angeles on Saturday. More than 3,000 participants, including marching bands, drill teams and dance groups took part in what is the largest Martin Luther King Day celebration in Southern California. Thanks to the many community leaders and organizations who make this annual event an opportunity to celebrate Dr. King's legacy! Heads up to Echo Park and Elysian Valley residents: on Saturday, January 22, Dodger Stadium will be hosting the first of two off-road world championship caliber shows. The event is expected to sell-out and all parking gates will be used for inbound and outbound traffic. The exhibition and racing will begin at 12:30PM and be completed shortly after 10:00PM. Join the Bangladeshi-American community in celebrating the designation of Little Bangladesh with the unveiling of the new sign marking this neighborhood. The festivities will be held on Saturday, January 15, at 3:00 PM at the corner of 3rd Street and Alexandria Avenue. Little Bangladesh is located between 3rd Street and Wilshire, and between Vermont and Western. More than 16,000 potholes were filled last weekend as part of "Operation Pothole." The effort dispatched approximately 50 city crews in a focused attack on potholes that were reported by residents across the city. I want to thank everyone who reported potholes and encourage people to continue to call 3-1-1 to report them. We have city crews on the streets everyday repairing potholes, but they need to know where they are. Cracking: Alligator cracking (see photo), edge cracking, and other types of cracks in the asphalt can be caused by poor drainage, an inadequate base, or heavy loads. In these cases, workers must determine the cause of the crack and repair it accordingly. Raveling: Raveling is when particles of asphalt wear away, leaving behind a rough surface. This requires a different kind of "patch" than a pothole. 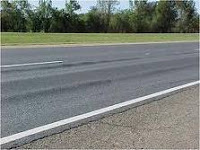 Rutting: Rutting (see photo) is a permanent deformation of pavement due to repeated exposure to heavy loads. Often, rutting occurs along the wheel path. 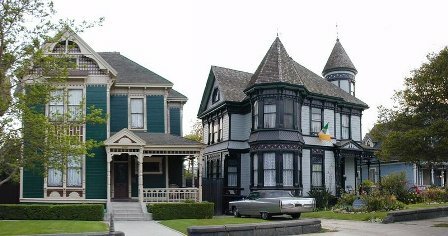 Rutting is typically addressed by resurfacing the street. These types of street damage can also be reported to 3-1-1, but will take longer to repair than a pothole. 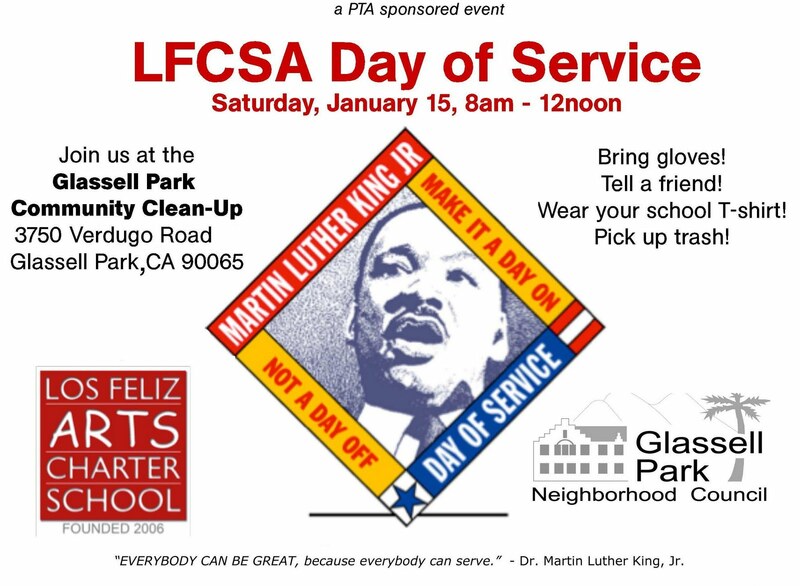 On Saturday, January 15, the Los Feliz Charter School for the Arts and the Glassell Park Neighborhood Council are hosting a community clean-up as part of the Day of Service honoring Dr. Martin Luther King, Jr. Volunteers should meet at the Glassell Park Community and Senior Center (3750 Verdugo Road) at 8 a.m. and are encouraged to bring their own gloves. The city is running “Operation Pothole” this weekend, January 8-9, to fill potholes caused by the recent rain storms. City crews are on the lookout for potholes, but don’t assume they will drive the same route you do. Call 3-1-1 so our crews know exactly where fixes need to be made. 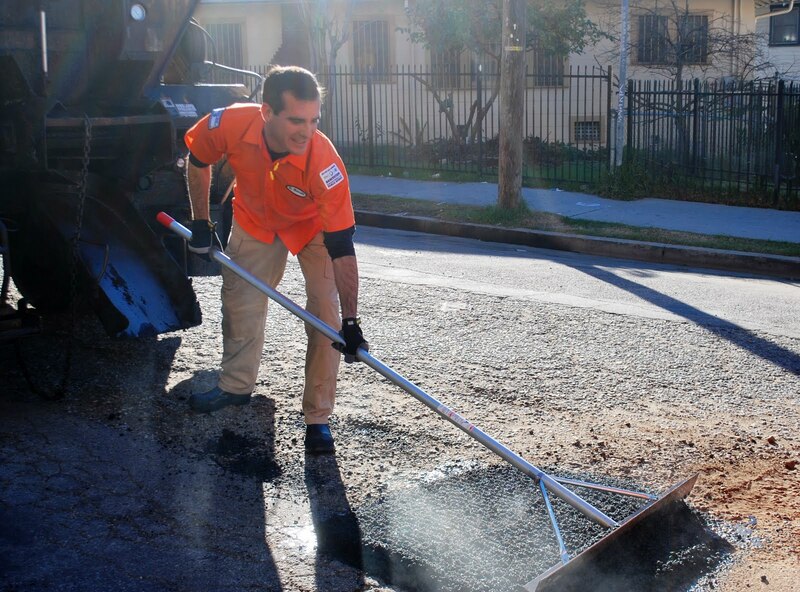 The Bureau of Street Services will deploy approximately 50 crews on Saturday and Sunday to repair an estimated 10,000 to 15,000 potholes before they cause traffic accidents, car damage, or grow larger and require more substantial repair. The crews will be focused on neighborhoods south of Mullholland on Saturday and in the San Fernando Valley on Sunday. My office is handling more than 150 pothole reports. Click here to view a list of the potholes we are making sure are repaired. 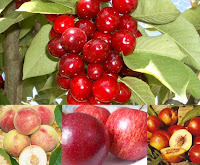 Click here to download a .csv file.